Rod Macqueen is a supremely talented individual that has navigated both sport and business worlds with aplomb. Known for his unorthodox but effective skill set, he is a lateral thinker and innovator who has been able to unite people and create successful environments that allow individuals to realise their potential. 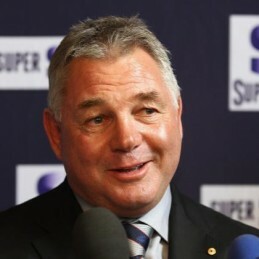 Rod coached the New South Wales Waratahs in Super Rugby to an undefeated year and instilled a club culture and playing structure with the ACT Brumbies. However Rod is best known as the coach of the Australian Wallabies who won the 1999 World Cup under his leadership. As coach of the Wallabies, the team had an incredible 81% winning ratio and won every trophy available, including: the Bledisloe Cup, Tri -Nations, and the Tom Richards Cup. In 1991, Rod started Advantage Line – a point-of-sale and merchandising business that grew into a multi-million dollar business. He now serves as the chairman and is on the board of several companies. He also consults to multi-nationals and is a member of the IRB’s Rugby Committee. Rod’s 2001 book, ‘One Step Ahead’, was both a sport and business best seller. The same year he was awarded the IRB’s International Coach of the Year. In 2002, in the lead-up to the 2003 Rugby World Cup, Rod was appointed by the federal government as a Business Ambassador and International Patron to the Rugby Business Club. Rod was further acknowledged on Australia Day 2003 with a Member of the Order of Australia. A highly accomplished and sought after professional speaker, Rod can inspire and captivate your audience with insight into how goals can be reached with existing resources. Rod speaks of the importance of combining organizational skills with lateral thinking, teamwork, dedication, values, celebrating achievement, and keeping a sense of humour.